We're proud that this versatile attachment has become a must-have in guitar shops. 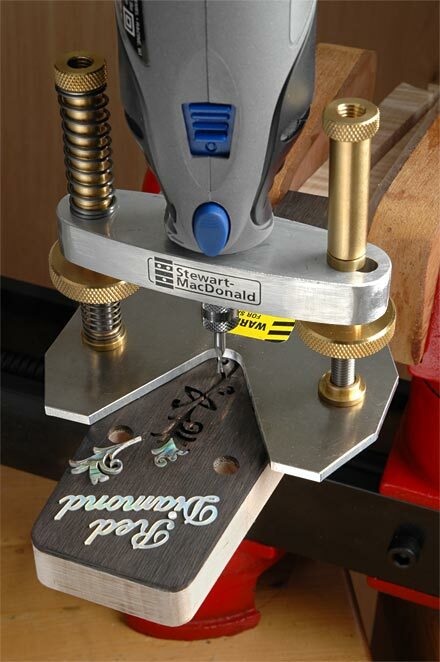 It's a StewMac exclusive, designed and refined right here, and it's made the Dremel a more versatile and accurate guitar shop tool than ever before. Do better-looking pearl inlay jobs. Clean or widen fret slots without tedious sawing. Perform light-duty routing with precise, reliable depth control. Our all-metal Precision Router Base attachment gives your Dremel no-wobble stability and more accurate depth adjustment than the stock plastic router base. We gave it a compact, easier to use size, and designed it to work seamlessly with other specialty jigs as well. Perform more accurate routing without guesswork. This is a high quality tool, made of durable machined steel, brass and aluminum. No plastic! Each turn of the large knurled thumbwheels adjusts your Dremel's cutting depth by .035" (.889mm). You can rout an inlay cavity that's precisely compensated for the thickness of the pearl and glue, for less sanding later. Tall twin handles give you excellent control for freehand routing, and you get a good view of your work. There's even a built-in nozzle for attaching a mini air pump to continuously blow away the dust—you'll rout inlay cavities more precisely, for a better fit requiring less filler. Click the button below to add the Precision Router Base 5260 to your wish list.